This is it, folks! Albert the Alien﻿ is back with new stories! 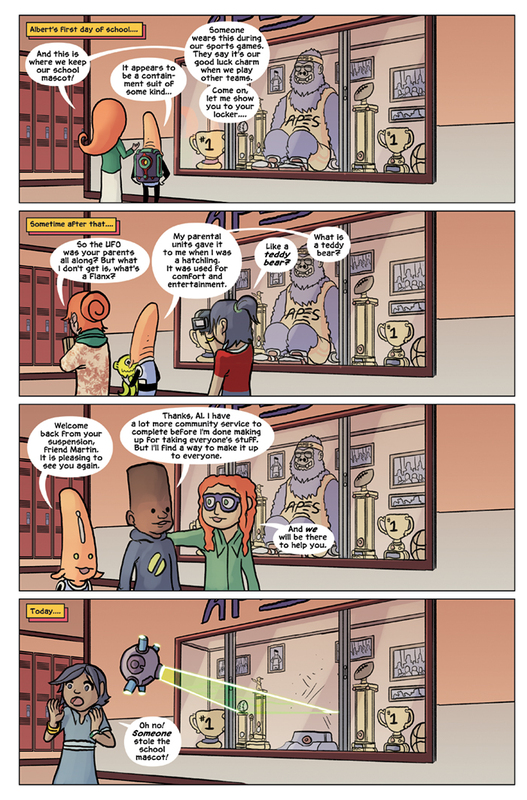 It’s a brand new chapter in the Substitute Teacher from Planet X story arc! Just so you know, we’re doing something a little different right now where Thrillbent subscribers get early access to story content. Not a subscriber? It’s only $3.99 per month (the same as a single print comic) and you get access to tons of digital comics and exclusives! Don’t want to be a subscriber to Thrillbent? Don’t worry – Albert the Alien will update with the same story content 4-6 weeks later here on this site. You still get the same access to awesome story content every Wednesday and Friday right here! Speaking of awesome content, we’re still taking pre-orders for the Albert the Alien graphic novel we successfully funded on Kickstarter. Interested in getting your hands on a copy (or another copy)? Click the link to get one today. This weekend Gabo and I are both attending Wizard World Chicago, here in Rosemont, Il. We’ll have the new Reading with Pictures volume 2: Comics That Make Kids Smarter! There’s a brand new Albert the Alien story in that book, so you should definitely pick it up!